We’d love your help. 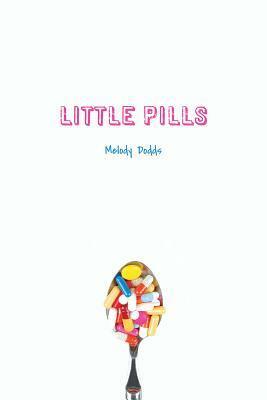 Let us know what’s wrong with this preview of Little Pills by Melody Dodds. To ask other readers questions about Little Pills, please sign up. There wasn't anything necessarily wrong with Little Pills, it just left me feeling like something was missing. I didn't really enjoy the dramatic narrative towards the end (how it would suddenly change to all caps and overusage of punctuation — I understand the idea behind it, but it didn't make me feel a sense of urgency as much as stronger phrasing would have), and the ending reminded me too much of the ending of Crank by Ellen Hopkins, which made it feel a little ripoff-y. Maybe I'm being unf There wasn't anything necessarily wrong with Little Pills, it just left me feeling like something was missing. I didn't really enjoy the dramatic narrative towards the end (how it would suddenly change to all caps and overusage of punctuation — I understand the idea behind it, but it didn't make me feel a sense of urgency as much as stronger phrasing would have), and the ending reminded me too much of the ending of Crank by Ellen Hopkins, which made it feel a little ripoff-y. Maybe I'm being unfair and wouldn't have felt that way if I hadn't read Crank, but it's hard not to compare the two a little bit. LITTLE PILLS, a novel in verse, tells a story of the impact pill addiction in an easily relatable manner that will appeal to middle grade, younger YA readers and reluctant readers. Kids who haven’t yet read verse will have no problems understanding the straightforward storytelling of Melody Dodds. I honestly don't see the point in this book, am I missing something? The blurb makes it seem like this is going to be a fictional story of some kind, but it's just mixed "slam poetry" which isn't even that good. Nowhere, either on Amazon or Goodreads, does it mention that this is poetry. I only knew it was before I started reading because the publisher gave me that information before giving me a copy of the book. If the book was written by a 17-year-old then I'd kind of understand why said 17-yea I honestly don't see the point in this book, am I missing something? If the book was written by a 17-year-old then I'd kind of understand why said 17-year-old (or slightly older if it's their past) wants to write this kind of book as for some people, it helps (but that's a whole different story). But the author is apparently "a chemist and former substitute teacher". Maybe I'm being judgemental but I can't see the writing in this book matching up to the author and that means it is fiction which makes me lose interest as it isn't personal.. I don't know if the other reviewer was asleep while reading this but this is in no way "inspiring", neither would I encourage a child or YA to read it. In fact, it romanticises drugs in most of the "poems". Most of the "poems" don't make any sense either. If you're wanting YA's to learn about substance abuse then there definitely are better ways than this book. (view spoiler)[Even after "Charlotte" gets caught taking those drugs, she goes on to say her "Gramma" told her: "It doesn’t matter. The habit is a thing that can find any of us. It comes home to roost.". Well jeez, thanks Gramma for your brilliant advice! (not) (hide spoiler)] After reading this I knew straight away that the author hasn't personally dealt with substance abuse and she was merely portraying the people she has helped in "a local youth center as a mentor and tutor" (her words, not mine). This is coming from a 21-year-old who has experienced substance abuse so I would sadly like to say that I know what I am talking about. If I had read this before I started taking or during the first few months then I doubt this would change my mind about what I was doing. I'm not saying it would've made me worse, but there is nothing "inspiring" about this. There are already too many (probably not too many, but there are already A LOT) of self-help and poetry books about mental illness and substance abuse from actual people who have dealt with it first hand. It is very clear that this author has only seen certain sides of it, therefore the writing wasn't anything special to read. Let me preface this review by letting you know that the e-ARC copy that I received of this book was in a PDF format that contained odd formatting. Some words had odd symbols or question marks instead of letters meaning I had to guess and stumble my way through some of it. Little Pills a lyrically told tale of prescription pill abuse and addiction. We follow 17-year-old Charlotte through getting hooked on and addicted to Oxycodone, a highly addictive painkiller. The story is told in verse and bec Let me preface this review by letting you know that the e-ARC copy that I received of this book was in a PDF format that contained odd formatting. Some words had odd symbols or question marks instead of letters meaning I had to guess and stumble my way through some of it. Little Pills a lyrically told tale of prescription pill abuse and addiction. We follow 17-year-old Charlotte through getting hooked on and addicted to Oxycodone, a highly addictive painkiller. The story is told in verse and because of this and the subject matter, I believe that fans of Ellen Hopkins' work may like this read. While I do love to read this kind of story and format, Little Pills disappointed me...a lot. My ebook was roughly 200 pages. 200 pages of verse is very short meaning this is a FAST read but not in a good way. It's too fast. It's too short. I feel like this story could have benefited from more depth and detail. There is no time to connect and care for Charlotte or her family and friends. When I finished it I was left feeling like this was a short introduction to a book but no? That was the book...all of it. Hello, Ms. Doods? Where is the rest of this book? I want the rest of the story? I want the in-between! I want the details?! Where were they? There is so much potential here but it falls incredibly flat. When I first started this and realized it was poetry, I didn't expect to like it. I found myself pleasantly surprised. The poetry format of the book helped to tell Char's story. It was completely honest story about how addiction can start and how we affect those around us. My only real complaint is that it did feel a bit short and rushed through. Check out this review and others at my blog Too Many Books! A special thank you to Netgalley and West 44 books for providing a free advance digital copy in exchange for an honest review. This verse novel follows Charlotte. One thing I find interesting in verse novels is that the plot can be a lot more relaxed, more about capturing moments in time and experiences. This is a perfect example of this collection of poetry that pieces experiences together to form a plot. The poems included were really g Check out this review and others at my blog Too Many Books! This verse novel follows Charlotte. One thing I find interesting in verse novels is that the plot can be a lot more relaxed, more about capturing moments in time and experiences. This is a perfect example of this collection of poetry that pieces experiences together to form a plot. The poems included were really good and enjoyable to read because of this focus on the form of the poems. I loved how slowly everything is introduced and explained how it goes on. The moments in time captured from Charlotte's point of view and emotions were really cool, especially because there are things that she doesn't fully understand, like why her sister doesn't get along with her anymore and a few other things. Her relationship with other characters were really interesting, especially with her older brother who while technically not there places a very important role within the context of the story. All of the characters had positive characteristics and flaws and while darker in subject matter than what I typically read, I enjoyed how real everything felt. The ending was more open ended than I typically enjoy but it was really well done and powerful. While it hints at what happens next, it is really cool how the book is both a beginning and an end of Charlotte's story, and also some place in the middle. It's definitely not happy but I still enjoyed these aspects of the book. This may have been partially because some of the lines were cut off on my eARC edition, but I think that there was more to it. I just got a little lost relating to what was going on and had to backtrack at times. Like I said, some lines were cut off on my copy so this may be partially responsible, but this is something to keep an eye out for. I had to keep backtracking and rereading. Little Pills is a novel written in verse, following a seventeen-year-old teen with her drug addiction. I found the novel to be creative in its delivery and I couldn’t put it down even though I wasn’t in love with the writing. What’s surprisingly good is that in a small number of pages, the author developed several characters and relationships; most characters made me feel something. There’s a solid backstory to the characters, and it highlights how drug addiction cannot be extracted from the envi Little Pills is a novel written in verse, following a seventeen-year-old teen with her drug addiction. I found the novel to be creative in its delivery and I couldn’t put it down even though I wasn’t in love with the writing. What’s surprisingly good is that in a small number of pages, the author developed several characters and relationships; most characters made me feel something. There’s a solid backstory to the characters, and it highlights how drug addiction cannot be extracted from the environment. Having said that, towards the ending, my emotional investment faded — something was missing, but I couldn’t figure out what it was. It could easily be the one-note direction of character development, that although interesting, was predictable. As a novel in verse, I have to consider (even more than usual) the style of writing. Overall, it was rushed and nowhere near fresh. I’d consider this to be an early draft, with the layout put to structure, but not yet embellished with writing. Many poems brushed the surface of conversations and didn’t delve as deep into the character as I would’ve liked. Moreover, formatting was somewhat basic, especially when it comes to several ALL CAPS sentences to show anger. It doesn’t help convey the anger, it only makes me want to skip to next page. At some points, it becomes the author writing poems to tell us a story, and it rarely feels as if it’s the main character talking to the paper, which is a huge loss in a first-person novel in verse. To sum up, I’m on the fence about this novel. Although I discussed several negative points, at the end of the day, I still enjoyed reading it. Rated as average, I consider that it was worth reading, but I wouldn’t quite recommend it to friends. I’ll leave it in your hands to decide with this one. A powerful poetry book, Little Pills by Melody Dodds is the story of seventeen year old Charlotte Navarro, who is struggling in many areas of her life- constantly in detention in school, missing her older brother who is away in the army, fighting with her little sister and wishing her mother did not have to work so many hours to keep body and soul together. The only joys she has in her life are reading, her friend Alexis and her music. When she begins to take some of her grandmother's pain medic A powerful poetry book, Little Pills by Melody Dodds is the story of seventeen year old Charlotte Navarro, who is struggling in many areas of her life- constantly in detention in school, missing her older brother who is away in the army, fighting with her little sister and wishing her mother did not have to work so many hours to keep body and soul together. The only joys she has in her life are reading, her friend Alexis and her music. When she begins to take some of her grandmother's pain medication to take the edge off, it helps. Life feels like floating on a cloud, and her new boyfriend is only too happy to float along too, but when the pills begin to run out and tempers start to fray, Charlotte is brought back down to earth with a bang when she thinks her little sister's friend has overdosed. Raw, powerful, emotional , this book had me hooked as easily as Charlotte got hooked on the oxy, I loved it's depiction of how addiction damages not just the addict but also their relationships with family and friends. It may be a short book, but it really says all that is needed. I know a book is something special when it leaves me feeling like the ending of this one did. To say more would be a spoiler, but I am sure that I will not be the only reader hoping against hope that Charlotte makes the right choice. Little Pills follows the descent of 17 year old Charlotte as she deals with opioid addiction. Over the past year she has struggled with several losses - her brother joined the army, her sister hates her, her mother works too much and her stepfather spends all day in his bedroom after losing his job due to arthritis. The loss that hit her the hardest was that of her favourite teacher and librarian, who left the school without warning. Charlotte turns to pills to cope with her recent losses and nu Little Pills follows the descent of 17 year old Charlotte as she deals with opioid addiction. Over the past year she has struggled with several losses - her brother joined the army, her sister hates her, her mother works too much and her stepfather spends all day in his bedroom after losing his job due to arthritis. The loss that hit her the hardest was that of her favourite teacher and librarian, who left the school without warning. Charlotte turns to pills to cope with her recent losses and numb the pain. At 200 pages, written in verse style, this was a super quick and easy read. However, it was a little too quick. 200 pages of verse style writing is about an hour's worth of reading. For someone who wants a quick peak into the life of a teenager struggling with addiction and doesn't care much for all the in between details, this is perfect... Unfortunately I am not that person and found myself wanting to know more. The story was so short that it completely skipped out on mentioning any sort of positive interaction between Charlotte and Mia, to the point where I felt a little lost during the final quarter of the book. This story has a lot of potential and could be suited for younger readers wanting to get a first glimpse into verse-style writing and the struggles of addiction. The Merriam-Webster dictionary defines addiction as a “compulsive need for and use of a habit-forming substance.” For some, these addictions can be as minuscule as a laptop or social media. For others, though, these addictions can become detrimental — affecting not only themselves, but the ones around them. For Melody Dodds’ novel, “Little Pills,” this is exactly what happens. Told through prose (think Ellen Hopkins), this story follows seventeen-year-old Charlotte, a young girl whose life is changed forever when she discovers the spiraling world that is Oxycontin. Weighing in at only a little over 200 pages, Dodds is able to convey the battle that is addiction, ultimately leaving us with a sorrow in her hearts for those who have dealt with the little pills. I'd like to thank NetGalley and the publishers for providing me with and arc in exchange for an honest review. This is most definitely not a book for everyone. It brings up some pretty touchy subjects, namely mental illness in the form of addiction. I appreciate how the author essentially wrote a cautionary tale of the impact addiction not only has on and individual, but on others around them, and how difficult it is to truly quit. Discussing mental illness is very important and must be done in t I'd like to thank NetGalley and the publishers for providing me with and arc in exchange for an honest review. Discussing mental illness is very important and must be done in the right way, which I feel Dodds did very well. Unfortunately, I'm not very into poetry and I there were many letters missing replaced with (? " ') etc. Not sure if that's because it was an arc or if that will also appear in the final copy. Seventeen-year-old Charlotte Navarro starts taking pills and more pills until her sister hates her, she meets a dangerous boy, and she steals from her Gramma. Will she get help before it's too late for her and her friends? "Little Pills" tells a provocative story about addiction and how it affects individuals, families and relationships. I read the book in an hour because I couldn't put it down. But it's a tough read. Any book about addiction, particularly with teens, troubles me since addiction Seventeen-year-old Charlotte Navarro starts taking pills and more pills until her sister hates her, she meets a dangerous boy, and she steals from her Gramma. Will she get help before it's too late for her and her friends? Little Pills is a story-in-verses that talks about drug addiction. The verses flowed perfectly, and I couldn't stop myself from finishing the book in an hour. It was so good. I especially loved the ending, since it was so full of hope and it left me with a smile. Nothing can be better than knowing that you'd accompanied a character in their journey towards becoming a better person than they'd been. In the limited time they got within the verses, the characters all managed to look whole and real, Little Pills is a story-in-verses that talks about drug addiction. The verses flowed perfectly, and I couldn't stop myself from finishing the book in an hour. It was so good. In the limited time they got within the verses, the characters all managed to look whole and real, which I really appreciate. It was a joy to read the verses sporting such well crafted characters. I really liked the way Little Pills picked up the topic of drug addiction in teens and turned it into a story with such a meaningful, not to mention hopeful ending. Little Pills was insightful, enjoyable and real. And I loved every part of it.